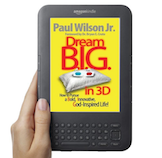 Dream BIG in 3D by Paul Wilson Jr | Live Your BIG Dreams! - Club D.A.R.E. Don't Stop Dreaming About Your Dream Life! Do you know why a lot of adults are grumpy and frustrated? It's because they left their dreams behind in their childhood. Many of them were told that when they became an adult they had to stop dreaming and become more responsible. That is only partly true. The dream God gave you as a child is supposed to be enjoyed as a adult. You owe it to yourself to see how far your dreams can take you. Don't be like grumpy adults. Start living your dreams now! 3 Major Ways Your Life Will Be Changed! 1) Strong CONVICTION that God created you to be someone special. 2) Special CONFIDENCE from developing a clear direction on which way to go. 3) Specific CLARITY after creating a sound plan for your dream career. 10 Benefits of ReadingThis Book and Following the Strategies! 1) Grow the confidence you need to live a creative, courageous, and compelling life! 2) Understand what makes you special and how you can stand out from the crowd! 3) Find the joy in doing what you were created to do! 4) Conquer any fears related to your career pursuits! 5) Develop a filter to determine the best opportunities for your unique talents! 6) Get free from the frustration of chasing other people's dreams! 7) Align your desired career path with your God-given purpose! 8) Increase your market value in the eyes of employers or customers! 9) Learn how to attract the right kind of audience who will pay you for your skills! 10) Create an easy-to-use road map to make your dream career come true! - Challenging one another to dream bigger. - Discovering the career path that expresses your purpose. - Keeping you from journeying alone through this process. - Holding each other accountable for following through on your plans. 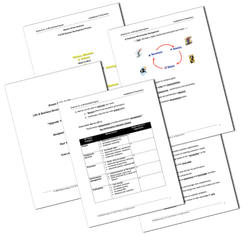 This is a great "vocational discipleship" tool to utilize within your youth ministry, college ministry, career ministry, small groups, or any group setting where you are challenging students to live missionally. *Please contact us today for special group pricing for your church or community group! Discover Your Dream. Create Your Impact. In this one-of-a-kind book God will show you how to connect your purpose, passions, and professional skills with the plans He has for your life. You will learn how to take your God-inspired dream and turn it into an awesome reality. This will position you to find fulfillment in doing the distinct things He created you to do. Dream B.I.G. 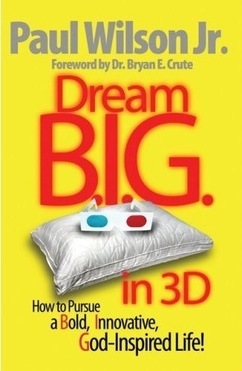 in 3D will teach you how to discover, develop, and drive your dreams by unleashing the God given inspiration to pursue your purpose and fulfill your potential in a B.I.G. way. God designed you for greatness so stop living below your potential! “This book can help change the trajectory of one’s life. Not only does Paul vividly and concisely chronicle his own journey to dreaming B.I.G., but he also purposefully and caringly lays out a blueprint to help others discover, define, and drive their B.I.G. dream. This is a valuable book to have.” ~ Timothy W. Goodly, Ph.D., Corporate Executive. “Paul Wilson's journey to know himself and to live the life God created him to live qualify him to write this book. If you are confused about who you are, who you aren't, and what path you should follow into the future, you have found the guide to help you answer your questions and discover your uniqueness. Don't rush through this book. Metabolize it. Prayerfully and deeply explore the tools and the process he presents. Find a friend to go through it together. And enjoy the adventure of a lifetime.” ~ Pete Richardson, President, Stratefication, Inc.
*Your purchase supports our 1 Million Dreams for 1 Millions Teens campaign. How to Pursue a Bold, Innovative, God-Inspired Life! The same powerful book, now available in your favorite digital format, including: Kindle, Apple iPad/iBooks, Nook, Sony Reader, Palm Doc and many more! Just click here or the download button. If you’re still breathing, God still wants to fulfill His purpose for your life through His dream for you. Dominate your doubts! Forget your fears! Bust out of the box! Take the limits off! Pursue your passion! It's time or you to live B.I.G. - Bold, Innovative, and God-inspired! - Fresh insights to connect the dots between your purpose, passions, & professional skills! - Renewed determination toward your dreams, goals, & aspirations! - Clarity, confidence, and courage to pursue your desired profession! - Empowerment to live on purpose! - Tools to build your legacy!